Please pay us a "real" visit soon. This is our Front Entrance. 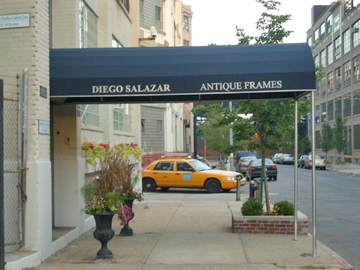 Diego Salazar is our landlord. He is an international trader in Antique Frames. The Sign near our front door. This is what you see when you walk inside the doors. Please ring our bell on the right so that we can let you in. their favorite of all the frames hanging in the hallways. and you'll see our door at the end. You'll also see . . . .
in the hallway right outside our front door. The hallway from the opposiite end. This is our front door. This is our Main Room. It's 1000+ square feet. We have our visual arts workshops and events here. Walk through Melissa Wolf's office. you know. Don't worry, you're not disturbing her . . . .
Alice also likes our comfortable arm chairs. one around . . . .
Let us show you the door. has a way with flowers. He's also meticulous about the window boxes. Wait just a minute ! This is the view of our space from 22nd Street. PLEASE PAY US A REAL VISIT SOON. HELP BUILD "YOUR" STUDIO. MAKE A CONTRIBUTION TODAY!